The emergence over the past three decades of neuroscientific tools such as MRI and CT scans has enabled researchers to observe living brains for the first time, an important development in determining culpability in criminal cases. 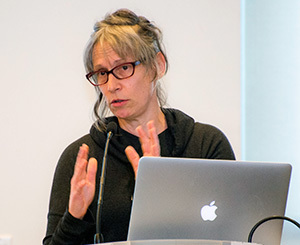 Continued research into intentionality, consciousness, and brain plasticity could, in time, increase the fairness of the criminal justice system, said Professor Deborah W. Denno, the center’s founding director, in her opening remarks. America’s criminal justice system is scarcely just for the two million people with serious mental illnesses arrested annually, said keynote speaker Hon. 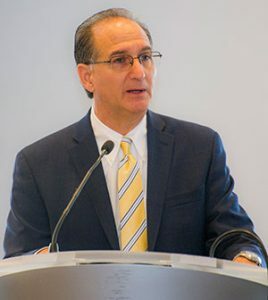 Steve Leifman, associate administrative judge for the Eleventh Judicial Circuit, Miami-Dade County Criminal Division. Despite giant leaps forward in brain research, the country’s treatment of its mentally ill has “gone backward” and remains in the “dark ages,” as states and local communities continue to apply a criminal-justice model—rather than a much preferable population-health model—to mental illnesses, Leifman explained. “That is a horrific commentary on our society and the way we do things,” Leifman said, calling it “stunning” that we don’t provide the treatment mentally ill individuals need and then punish them for this lack of care by arresting them en masse. It’s not for lack of money. America’s counties spend a combined $80 billion on jailing the mentally ill, even as they struggle to pay for roads, bridges, hospitals, and schools. The results, Leifman noted, include increased homelessness, police injuries, and police shootings of mentally people. The answer to this “shameful American tragedy” is not building better jails for people with mental illnesses, Leifman said. “The answer is developing better systems of care so people with mental illnesses don’t come into the criminal justice system to begin with,” he said. The Stepping Up Initiative, featuring Leifman, fellow panelist and mental health coordinator for the Portland, Maine, police department Jo Freeman, and other leading voices for reform, has partnered with counties, law enforcement, and psychiatric associations to work toward making structural changes that allow people with mental illness to access services, stay out of the criminal justice system, and lead fulfilling lives. “We need to start looking at the brain issues, not the behavior side of it, to figure out why people are doing what they are doing so we can break this cycle, and that’s why the synergy of what you are teaching here is so critical to teach the rest of the country,” Leifman said, proclaiming Denno’s work on neuroscience issues in the law as a guide to the rest of the country. Schizophrenia afflicts a large portion of the mentally ill in jail, underscoring the need for earlier treatment of people experiencing symptoms such as delusions and hallucinations, said Jeffrey Borenstein, president and CEO of Brain and Behavior Research Foundation. Borenstein also shared insights into potential “extraordinary advances in psychiatry” using the drug ketamine, a medicine commonly used in anesthesia, to treat depression in two to four hours, as opposed to weeks. Borenstein made his comments during the first panel, titled “The Real-World Impact of the Brain Sciences,” which was moderated by Fordham Law Professor Clare Huntington. Other panelists included trial attorney Susan K. Marcus and Janet F. Rosenzweig, executive director of the American Professional Society on the Abuse of Children. “The Science and Psychology of Brain Dysfunction,” the following panel moderated by Denno, highlighted, among other topics, emerging domains in which neuroscience is offered in criminal cases. Forensic applications for techniques such as lie detection, violence risk, and clinical diagnosis have been widely researched in recent years, noted Professor Barry Rosenfeld, chair of Fordham University’s Department of Psychology and an adjunct professor at Fordham Law School. Rosenfeld expressed skepticism about recent neuroscience studies exploring whether regions of the brain light up based on whether someone is telling the truth or a lie. “Until we see some hard evidence, what we have is incredibly expensive techniques to do what polygraphs have been doing for 100 years,” Rosenfeld said. These techniques “don’t seem to provide any of the real-world applications that we might want if we’re going to make predictions about what people might be like in the future,” he added. In the same panel, Professor Ruben Gur, director of the Brain Behavior Laboratory at the University of Pennsylvania, outlined some of the innovative methods his lab is incorporating in its neuroscience research and the challenges these techniques will doubtless encounter in the ongoing relationship between science and the law. Other panelists in the afternoon included Adam Kolber, professor of law at Brooklyn Law School, and Holly Moore, director of Laboratory Resource Management at the New York State Psychiatric Institute.